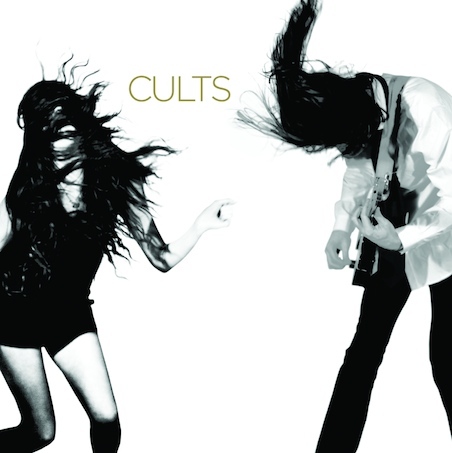 When Cults‘ “Go Outside” first appeared on the web last year, it spread like wildfire. It was catchy and sweet, the kind of sing-along that felt like it was pulled from the air, with a sentiment perfect for anyone stuck in an office or addicted to the Internet. But how many communal sing-alongs can a band make before the approach goes stale? Cults have opted not to find out. “Go Outside” is on their debut album, and it still gives you your entire recommended daily allowance of vitamin D, but its dreamy drift is just one side of a band that proves it has the dexterity and songwriting chops to make a varied and memorable album. Much has been made about the speed with which Cults signed to Columbia, as if they’re the first group to release a debut album on a major. That kind of rapid ascent isn’t anything new, but the speculation that came with it– online chatter pronouncing them destined for the one-hit-wonder bin– now looks grossly off the mark. At the center of the band’s appeal is singer Madeline Follin’s youthful alto. She has a tone that creates the impression you’re listening to a precocious tween fronting a band well versed in Phil Spector’s Back to Mono and three decades of climactic indie pop. The 1960s girl-pop element of their sound is pretty evident on the surface– “You Know What I Mean” even borrows its verse melody from the Supremes’ “Where Did Our Love Go“– but what they’ve done with it is pure 21st century, cutting it with synths, guitars, and softly integrated samples.